What Are Some Real-Life Applications of Trigonometry? Trigonometry, the branch of mathematics that describes the relationship between the angles and lengths of triangles, helped early explorers plot the stars and navigate the seas. Nowadays, trigonometry is found in everything from architecture to zigzag scissors. While it may seem as if trigonometry is never used outside of the classroom, you may be surprised to learn just how often trigonometry and its applications are encountered in the real world. Much of architecture and engineering relies on triangular supports. 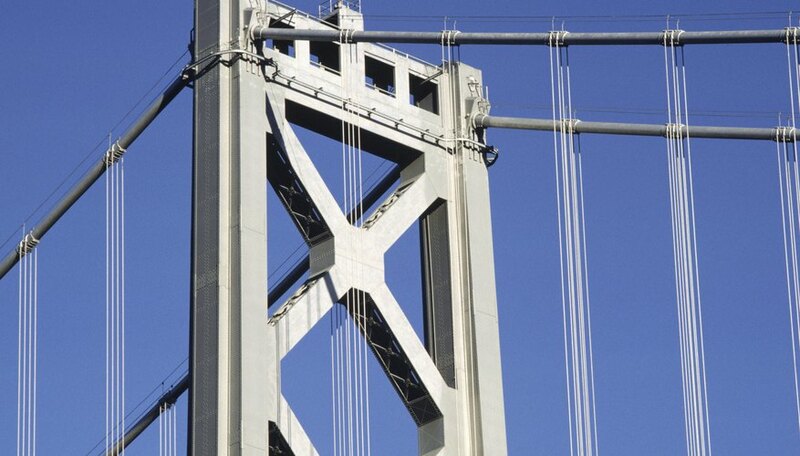 When an engineer determines the length of cables, the height of support towers, and the angle between the two when gauging weight loads and bridge strength, trigonometry helps him to calculate the correct angles. It also allows builders to correctly lay out a curved wall, figure the proper slope of a roof or the correct height and rise of a stairway. You can also use trigonometry at home to determine the height of a tree on your property without the need to climb dozens of feet in the air, or find the square footage of a curved piece of land. Trigonometry plays a major role in musical theory and production. Sound waves travel in a repeating wave pattern, which can be represented graphically by sine and cosine functions. A single note can be modeled on a sine curve, and a chord can be modeled with multiple sine curves used in conjunction with one another. A graphical representation of music allows computers to create and understand sounds. It also allows sound engineers to visualize sound waves so that they can adjust volume, pitch and other elements to create the desired sound effects. Trigonometry plays an important role in speaker placement as well, since the angles of sound waves hitting the ears can influence the sound quality. Modern power companies use alternating current to send electricity over long-distance wires. In an alternating current, the electrical charge regularly reverses direction to deliver power safely and reliably to homes and businesses. Electrical engineers use trigonometry to model this flow and the change of direction, with the sine function used to model voltage. Every time you flip on a light switch or turn on the television, you’re benefiting from one of trigonometry's many uses. Trigonometry plays a major role in industry, where it allows manufacturers to create everything from automobiles to zigzag scissors. Engineers rely on trigonometric relationships to determine the sizes and angles of mechanical parts used in machinery, tools and equipment. This math plays a major role in automotive engineering, allowing car companies to size each part correctly and ensure they work safely together. Trigonometry is also used by seamstresses where determining the angle of darts or length of fabric needed to craft a certain shape of skirt or shirt is accomplished using basic trigonometric relationships. Cornell University: How is Astronomy Impacted by Trigonometry? Beach, Emily. "What Are Some Real-Life Applications of Trigonometry?" Sciencing, https://sciencing.com/real-life-applications-trigonometry-7769833.html. 13 March 2018.